Live display of amps, volts, mAh, temperatures and RPM. approximately how much time is left. Supports both metric and english units. 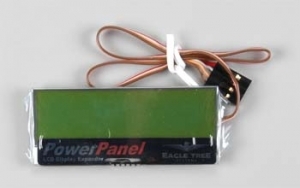 INCLUDES: Eagle Tree Power Panel LCD Display Expander with 11" (279mm) data cable and instruction sheet. Dimensions: 2.5 x 1" x 3/16" , 63 x 26 x 5mm approx.